I hadn't planned to revisiting this so soon. While checking out the weather, I realized tonight was the best time to get outside for a run over the upcoming three days. I planned a nice long run. Another chance to evaluate the new form. I elected to run the exact same route as Saturday morning (well, the last .2 of it was different). I decided not to focus on pace but rather cadence. I set my Garmin to only display heart rate and cadence. I tried to stick to a cadence of 80. Based on my tests that would give me a pace just over 8:00 minutes. So I hit the road. For the most part, I couldn't keep my cadence at 80. It was mostly in the 85 range. I knew my toughest challenge would be the hills so I focused on getting my cadence to 80 and it made the hills much more manageable. The results were amazing! Compared to Saturday, my pace was 31 seconds faster. It wasn't in the 8:00 range but it was 8:17 compared to 8:48. My heart rate was only 5 beats per minute faster. The cadence was even lower today, which is to be expected with the longer stride. 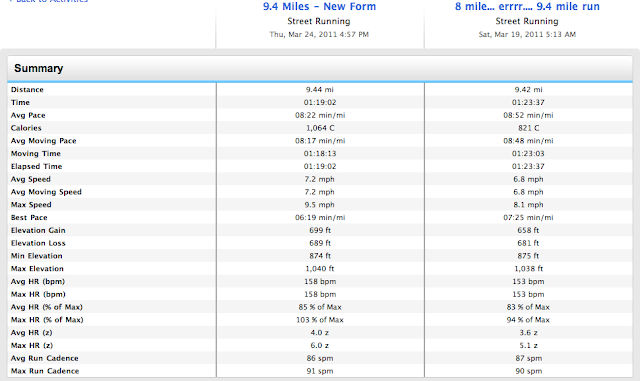 Remember, this was over 9.5 miles with some nasty hills. I'm just absolutely elated! NOTE: The .2 mile route change at the end did have a big change in elevation but I was taking the higher elevation with the new form. I will start doing some more research on this running form to see what else I can learn. Going forward I plan to stick to the mid-80s for the pace. After a couple weeks, I'll push it up to 90 to see how it goes. I'll do it as part of my training for the Trolley Run on April 17. I just love the fact that I am still improving the one triathlon discipline that I felt most comfortable. I'm looking forward to the running aspect of the training again! Great job!! I enjoy following your experiment's progress! Thanks! It's been quite fun and interesting!